Poached eggs are pretty much my most favorite way to eat an egg. I’ve poached eggs for breakfast, lunch and dinner and never seem to get tired of them. I used to have trouble making the perfect poach and I tried all kinds of method from vigorously swirling the water to create a funnel to boiling the eggs in the shell for just a few seconds before cracking them. Nothing worked and I’d end up with raggedy looking disasters on toast. But after a ton of online searching last year, I came up with my tried and true method for the perfect poached egg. Listen up! 1. Start with a super fresh egg. I always use free range eggs and using free range organic is even better. If you start with a quality product, you’ll end up with one too. 2. In a large saucepan or a pot, bring a small amount of water to a boil. You don’t need to over do it on the water…about 3 inches deep works wonderfully. 3. Gently crack your egg into a small tea cup. I always use my 1970’s vintage owl motif mugs for this task because I think they eggs get happier and tastier inside of a pretty cup. 4. While the water is boiling, add in salt and a teaspoon of vinegar. I use apple cider vinegar because I think it gives the egg an extra nice (but very subtle) flavour. The vinegar doesn’t just add a bit of tang, it also helps to bind all of that swirly egg whites to the egg, so don’t skip this part! 5. Now, gently slide your teacup into the water. Let the boiling water enter the teacup for a few seconds before sliding the egg out of the mug. This lets the egg set a bit before setting it free into your pot. Depending on the size of your pot, you can add a few eggs at once, but make sure you follow the teacup method for each egg. Cover and turn the heat down to a simmer. Poached Eggs scare the shell out of me. Thank you for sharing this eggcellent tutorial! I agree, poaching eggs have never been my forte but I am so excited to try again… ive known about the vinigar but maybe the letting the boiling water enter the tea cup part is where i am going wrong- as in ive never done that before. also uwing an owl motif tea cup would probably help my cause. I can’t wait to try this– I mess up so many eggs in my attempts to poach. Thanks for the hints! i had given up poaching eggs. now, i’ll give it another chance. Thanks, I need to try it! I’ve been scared to get closed to poached eggs until I saw your entry. 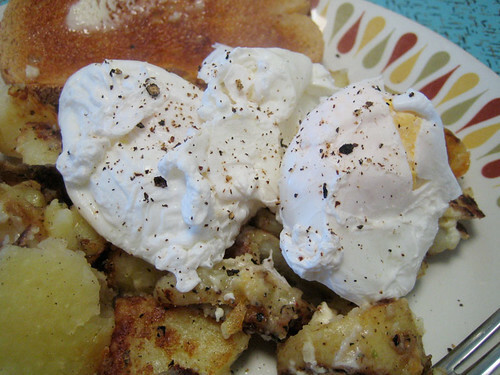 That night, I made some hard-poached eggs for the kids and I and we loved them! Thank you! Oh man, putting boiling water INTO the teacup? Genius! Maybe now I can actually poach an egg intact. Thank you! how lovely and excellent! love your way of describing things. har har, eviedee! you stole the puns right outta my mouth!! jennifer, i hope it works for you! tricia, yes, one more chance!! kalyn, it’s really quite a simple method and for me it works every time! scott, yes, apple cider vinegar is awesome! eileen: yes, just before you tilt your egg into the pot, let the cup fill a bit with the water and all should be well! YES!!! This is my favorite way for SURE, but I have never actually tried it (too scared!). Perhaps–just maybe–with this excellent guide, I shall bravely soldier ahead?? Amen on item number 4. I’ve been on an apple cider vinegar kick lately. I’m using it everywhere I can think of. I’m gonna try the teacup trick, too. This is the way I make poached eggs now! I learned the vinegar and cup trick ( sans owl) a few years ago, and have had great eggs ever since. Before I used to cheat and use the poaching cups…but they always seemed too perfect…like egg mcmuffin eggs. I am going to make some this week..thanks for the reminder! I enjoy poached eggs a great deal but have never been able to make them successfully and home and gave up on trying years ago. Nowadays, I only order poached eggs on brunch outings. I will definitely try this technique one day and see if I can make up for lost time… thanks for the tutorial!! Brilliant! As soon as I read that it could be that easy to poach eggs, I needed to try. Your tips, a bowl (used instead of a teacup), and 2.5 minutes of cooking time gave me perfect, slightly-runny eggs. Thank you! wow I never thought of poaching egs this way, I think the teacup thing is a brill idea! Are you going to the eggs class in Bellingham that Molly-Orangette is teaching? I am hoping to go. Why did I not know about this years ago? I eat eggs sometimes and like them as close to raw as possible. Marvelous Idea! I so can’t do this lol I tried..messed it up … ROTFL ahhh well someday, someday! hag, i never used those poaching cups…as i prefer the free-form white blob look! bbaking, it works! give it a try. lydia, i’d love to go to bellingham and take molly’s class…but seeing as i don’t drive, i won’t be there. raw food diva, this is such a great way to eat eggs…and if you like ’em raw-ish, then just cook them for a lot less time! jenn, bummer! what went wrong? were you not using fresh eggs? hmmmm. aria, this method is worth a shot! I’ve never poached an egg but your pictures look scrumptious! Do you put the vinegar and salt in the teacup or the boiling water? 🙂 I can’t wait to try this… The Man would just die if I gave him Eggs Benedict. laura, funny story about your mom! I guess we all stick with what we know. domestic spaz, you add the salt and vinegar to the pot of boiling water, then with your teacup filled with the egg, gently slide it in the water, letting the boiling water fill the cup before releasing the egg into the briny depths! Good tips. Now I’m hungry for eggs and toast. Mmm. I love poached eggs. I use little poaching cups, but you’ve made it look very easy to try it without them. I want an owl tea cup. I use the little pyrex bowls I keep on hand for mise en place, and they work great. I like my eggs runny inside, and I’ve found that the perfect timing is to bring the water to a boil, add the vinegar (I’ve always used plain white, but now I’ll try cider! ), turn off the heat, put in the eggs, cover the pan and let sit for 3.5 minutes. The yolk comes out to be that perfect runny/luxurious sauce consistency. 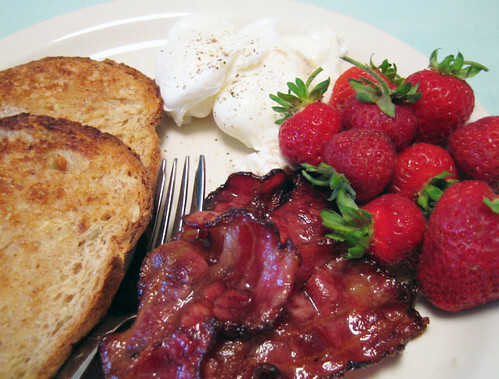 Yum… I’m thinking poached eggs for dinner now, it’s been too long. OMG! Isn’t it amazing that eggs can be such a hot item on the net?! My secret: Line a small cup with saran wrap, crack the egg into in, tie the ends of the wrap together at the top and lower the bundle into boiling water until cooked. Easy peasy. perfect poached eggs!!! (i’m sitting at my desk eating them right now)first time making them and first success! thank you very much indeed. i just poached some eggs using your method and they were yummy. i was a little skeptical about the vinegar [especially since i had balsamic]… the boiling vinegar water did not smell pleasant and i feared for my eggs. but i trusted you and they came out delicious! while i was eating them i got this wonderful sense memory of when my dad used to make me poached or hardboiled eggs, chopped up, on toast for breakfast when i was a kid. it made me awww!! so thanks for the memories, hun. This method is pure genious – thanks for sharing! Ooo excellent post. I love poached eggs when I’m out (especially with hollandaise sauce) but had no idea how to make them at home. jen, best wishes in all your future egg poaching endeavours! lynn, eggs and toast can be just the perfect thing! linda, i saw those poaching cups for the first time in the stores over christmas. owl teacups are the best, michelle! but i’m sure little pyrex cups are just as great! interesting jennie! i’d be a bit worried about melting the plastic or leeching chemicals onto my eggs! but sometimes i can be a bit paranoid that way. angie, hooray for your egg poaching success!! jessika, glad your fears were conquered and you enjoyed your eggs with toast! yum. yvonne, glad it doesn’t matter what kind of vinegar you use! eat me delicious, now i’ll have to try making a hollandaise sauce next! I used to make poached eggs while making chicken soup with vegetables. I found your recipe simply delicious, really thanks! Thanks for the step-by-step. 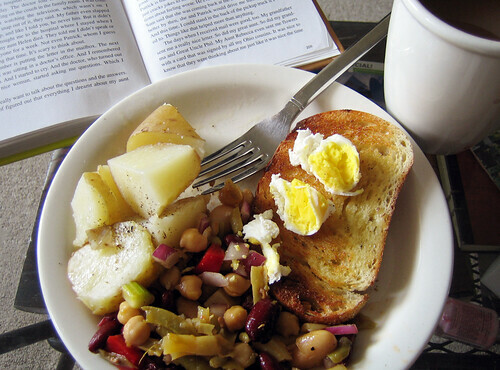 I ended up making poached eggs for breakfast on both Saturday and Sunday mornings this past weekend. I was so proud of myself! 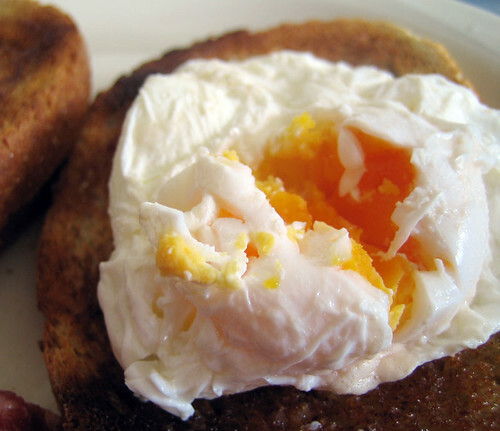 i have a confession…i love over easy fried eggs sooo much-i’ve never even eaten a poached egg! but this looks doable-gotta try it. Valid point about the chemicals! Luckily, the rules are very harsh concerning chemicals in food related (and childrens’) products here, and I only poach eggs three times a year so I don’t think my dna has suffered any damage. I will try your method though! Yessiree – I made poached eggs for breakfast this a.m. and they were a hit with the husband…the only thing I would change next time is to leave them in the boiling water longer to firmly set the white part as some of mine came out a bit runny…also, I did not find the subtle vinegar smell off-putting!!Yeah! Hi I had breakfast in a decent restaurant recently and they served poached eggs which were PERFECTLY round like boiled eggs would be – no straggly bits, no collapsed bits and no ‘fried egg shape’ like those egg poaching pans create. How did they do that? ?Is there an additional trick these chefs know about??? It worked like a dream! I’ve never poached an egg in my life, but it came out perfect! Now I just need to find a good, quick Hollandaise sauce…thanks! Oh thank you for demystifying the poached egg! I just made and ate two and they were excellent! Yum!! If you’ve got the manual dexterity for it, you can do the cup trick with the eggshell itself, just break the larger end off about 1/3 of the way down, and hold just in the water for a few moments before gently tipping over. I made perfectly poached eggs today! Thanks to you, my husband can now enjoy his eggs the way he likes them best. I would think you might scald your fingers if you used the eggshell rather than a teacup. The steam rising from the water was quite hot….ouch! I really hope this works! If it does, you are a genius! Sorry but it doesn't work for me used my prettiest cup and still ended up with a mess! Anon, maybe your egg wasn't fresh? If it's a good quality, fresh egg it should work like a dream. this amazed me! i have always been let down by the freestyle method of egg poaching but this turned out perfectly poached eggs that looked beautiful and were perfectly cooked. great tips! 1. when adding the egg to the simmering water, drop it in as close to the surface of the water as possible. Do it from higher and the extra drop causes the egg to break apart more when it hits the bottom of the pan. 2. If you like a runny yolk but solid whites, watch the egg closely as it cooks. It cooks from the outsides in, so giving the pan a gentle shake causes the egg whites to ripple showing how cooked they are. When you shake it and the egg whites dont ripple, your egg is done with a perfectly runny yolk. Ok, I’ll try poaching eggs one more time. One. More. Time. I’ve nearly given up but I’ll give it a shot. Do add vinegar to the water but not salt. Vinegar helps thicken the white so it won’t spread but salt does the opposite. Don’t use boiling water, the movement will mess up the whites; heat the water just below the boiling point. Stirring the water and sliding the egg into the center of the whirpool does help hold them together to make a neater egg but forces you to only cook one egg at a time so I usually don’t swirl. Personally I like my poached eggs very soft with the whites still a little runny. It is very hard to get restaurants to cook them this way because they are afraid the undercooked egg will poison someone and lead to a lawsuit. I buy good eggs and hope for the best. In 30 years of eating raw eggs in nog and undercooked eggs for breakfast I haven’t gotten sick yet. I found this via your Anytime Meal! What a great breakdown. 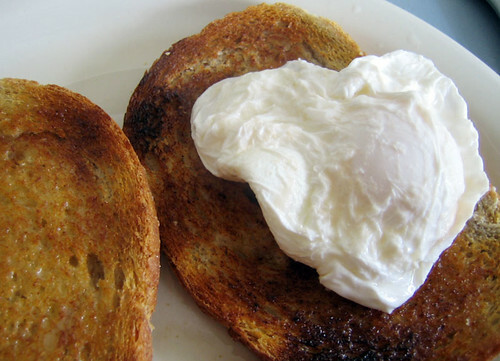 I’ve read countless “how to poach perfect eggs” type blogs. FINALLY! These eggs were perfect. I used a tea cup without owls but other than that I followed directions as listed ;). Thanks. This will be how I poach eggs from now on and will no longer google before cooking.